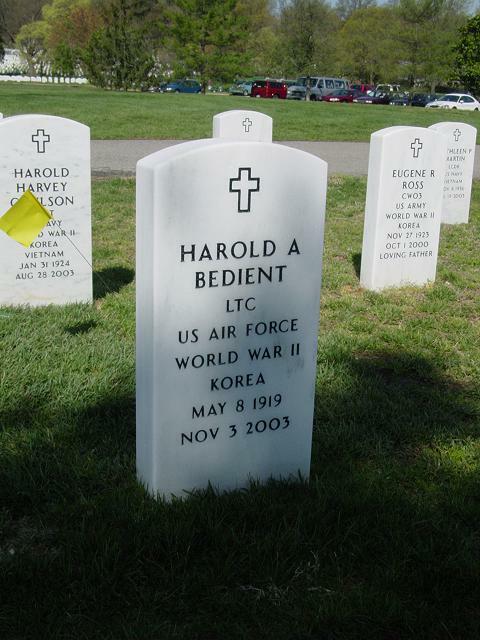 Harold Arthur Bedient Jr., 84, who helped develop the world's weather reporting system and designed an automated flight planning system, died November 3, 2003, at the Maine Veterans' Home in South Paris, Maine. He had Alzheimer's disease. Colonel Bedient served in the Air Forces twice -- during World War II and from 1949 to 1965, retiring as a Lieutenant Colonel. It was during his second stint that he began working in meteorology and helped establish the computer models and systems that improved worldwide weather prediction and reporting, based at the National Oceanic and Atmosphere Administration's National Meteorological Center in Camp Springs and at the U.S. Weather Bureau in Suitland. From 1965 to 1983, he was chief of the center's automation division and helped to create the World Weather Watch, which establishes basic meteorological data and standards. For his work, Colonel Bedient was known by his colleagues as the "father of weather automation." He was born in Ithaca, New York, and spent the first six years of his life in China, where his father was a Methodist missionary. He graduated in 1941 with honors from what is now Park University in Missouri and enlisted in the Army Air Forces. He became a fighter pilot with the Flying Tigers and served in the China-Burma-India theater. His decorations included the Air Medal. After he left the military in 1946, he received a master's degree in meteorology from the University of Chicago. He reentered the service in 1949, after it became the U.S. Air Force. In 1987, he traveled to China with People to People International, which promotes cross-cultural understanding, to confer with meteorologists from other countries. He also worked with Johns Hopkins University in its program to design computers for people with disabilities. For many years, he was a Presbyterian elder and deacon and a member of church choirs at District Heights Presbyterian Church and Camp Springs Presbyterian Church in Temple Hills. Later in life, he returned to his Methodist roots and was a member of Trinity United Methodist Church in Prince Frederick. He sang in the National Cathedral Choral Society in Washington for more than 15 years. In 1999, he moved to Maine. His first wife, Margaret Mason Bedient, died in 1977. Survivors include his wife of 25 years, Thelma Taylor Ward Bedient of Norway, Maine; five children from his first marriage, Elizabeth J. Bedient of Aurora, Colorado, Robert M. Bedient of Rocky Mount, Missouri, Bruce F. Bedient of Lawrenceville, New Jersey, Susan F. Bedient of Port Townsend, Washington, and Ann L. Bedient of Easton, Maryland; four stepchildren, Jerry J. Ward of Marietta, Georgia, Barbara A. Haveland of Key West, Florida, Jeffrey A. Ward of Norway and Susan L. Burkey of Nashville; three brothers; a sister; 17 grandchildren; and a great-grandchild. Harold Arthur Bedient, Jr., 84, of Norway, ME, formerly of the Washington, DC area died Monday, November 3, 2003 at the Maine Veterans Home in South Paris, ME. He is survived by his wife of 25 years Thelma Taylor (Ward) Bedient of Norway, ME; his children Elizabeth J. Bedient and her husband John W. Lathrop of Aurora, CO; Robert M. Bedient of Rocky Mount, MO; Bruce F. Bedient and his wife Susan A., of Lawrenceville, NJ; Susan F. Bedient of Port Townsend, WA; and Ann L. Bedient of Easton, MD. His step-children: Jerry J. Ward and his wife Marjorie P. of Marietta, GA; Barbara A. Haveland and her husband Richard D. of Key West, FL; Jeffrey A. Ward and his wife Janet F. of Norway, ME; and Susan L. Burkey and her husband James C. of Nashville, TN. There are 17 grandchildren and one great grandchild. Art is also survived by four siblings: Phillip E. Bedient of Dalton, MA; Jack D. Bedient of Scottsdale, AZ; C. Kenneth Bedient of Cheboygan, MI; and Irene B. Tetzlaff of Kalamazoo, MI. He was predeceased by his first wife Margaret Mason Bedient; and a sister Jane B. Ware of Burr Oak, MI. A Memorial service will be held on Thursday, November 6 at 1:00 PM at the Deering Memorial Methodist Church in South Paris, Maine. Memorial service on December 16, at 10 a.m. at The Unity Presbyterian Church, Camp Springs, MD followed by interment with full military honors at 1 P.M. at Arlington National Cemetery. A reception will be held at the church following interment. Remembrance donations can be made to the Maine Veterans Home, 477 High Street, South Paris, ME 04281 or the the Alzheimer's Association of Maine, 163 Lancaster St., Suite 160B, Portland, ME 04101. Arrangements are under the direction of Weston-Chandler Funeral Home 230 Main St., Norway, Maine.